El Salvador has become the first country in the world to ban mining for gold and other metals. The vote by its legislative assembly on March 29 marked the culmination a multi-year campaign in which the archbishop of San Salvador and the Jesuit-run Central American University (U.C.A.) played a major role. The ban’s proponents say industrial mining practices posed a grave risk to the country’s already limited water supply. The mining ban’s proponents say industrial mining practices posed a grave risk to the country’s already limited water supply. 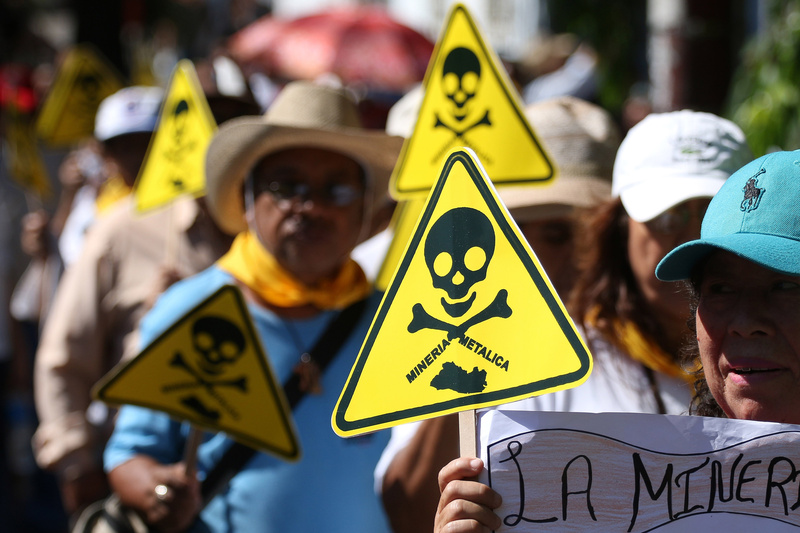 Contamination from previous mining efforts has already reached alarming levels in El Salvador. Ban advocates say that new mining would jeopardize the Lempa River, the country’s major water source. Archbishop Escobar Alas told Vatican Radio that while mining always causes some damage, “in our country it would be even worse.” He added that the country’s mining laws were so weak that a legal ban was the only remedy. The bill calling for the ban was presented to the assembly in February. On March 9, supporters marched from downtown San Salvador to the assembly building to press legislators for action. Leading the march were Archbishop Escobar Alas, U.C.A. rector Andreu Oliva, S.J., and José María Tojeira, S.J., director of the U.C.A.’s Human Rights Institute and former provincial for Central America. The new law orders the economy ministry to close existing mines while prohibiting the government from issuing new mining licenses and gives small-scale and artisanal miners a two-year period to phase out production. Mining had become highly contentious in the country of 6.3 million, as environmental groups protested the effects on water sources and soil contamination. Anti-mining groups have claimed that at least four people had died in mining conflicts. Until now, mining companies have been blocked by temporary bans declared by the country’s last three presidents. That led a Canadian company, Pacific Rim (later bought by OceanaGold), to sue El Salvador in the World Bank’s International Centre for the Settlement of Investment Disputes. The company demanded that El Salvador pay it $250 million in compensation for having denied its request to launch a mining project. In October last year, I.C.S.I.D. not only ruled in favor of El Salvador but ordered OceanaGold to pay El Salvador $8 million to help defray the expenses it incurred in its legal defense. So far OceanaGold has declined to pay any of that sum, and last week I.C.S.I.D. issued a supplementary ruling, ordering the company to pay interest as well. The issue has united El Salvador’s bishops. Archbishop Escobar Alas’s predecessor, Fernando Saenz Lacalle, was a member of Opus Dei and was regarded as socially and politically conservative on many issues. But he had studied chemistry before entering the seminary and was well aware of the damage caused by the use of cyanide in the mining process. “We don’t want one drop of it entering the country,” he said. Although it is the first nationwide metal mining ban, other countries already ban some mining processes, like the use of cyanide to extract gold. Anti-mining groups praised the Salvadoran vote. "It is amazing what this small country has achieved against tremendous odds," said Manuel Perez-Rocha of the Institute for Policy Studies in Washington. The institute, part of the International Allies coalition with the National Roundtable Against Metallic Mining in El Salvador, sees the law as "an inspiration for countries throughout the region,'' he said. How wonderful to see clergymen in Central America continuing the legacy of Oscar Romero working arm and arm with the people of El Salvador to address life threatening issues threatening them. Would that our religious leaders in the United States heed the example of our brothers and sisters to our South! Economists and sociologists will tell you that when you ban a profitable economic activity (rather than regulate it), you get a bootleg economy which operates outside the bounds of commercial law, and in the end corrupts the entire political process. Listen up, moral theologians -- you create "the near occasion of sin", enticing otherwise law-abiding citizens to participate in the black economy. Thank you for your comment on my article. I have a question for you. I hope you’ll reply. Do you think that the point you made applies in the specific case of metallic mining in El Salvador? First: almost everyone who’s studied the subject believes that there were good reasons, compelling reasons, for the ban; that’s why, in this very polarized country, where the political parties agree on so few things, they all agreed on this one; the vote in the assembly was nearly unanimous. But will the result of that vote be the emergence of the kind of bootleg economy you describe? I don’t see how that can be the case. First, it takes huge investments – multi-million dollar investments – to do mining. Who will be willing and able to risk such --amounts when the illegal activity – mining – is something that can only be done in plain sight – and, in this case, in the sight of a country where almost everyone disapproves of what your doing, seeing it as a grave threat to their country’s water supply? It seems to me that, much as they might want to do it, they couldn’t get away with it. What do you think? John, do we conclude that capitalism perhaps is not a democracy? Gene Palumbo contributed this report from El Salvador. It includes reporting from Catholic News Service.